Duke had ’em. Bird had ’em. Miles had ’em. You got Chops? This deck of cards from Big E Toys is truly unique. Use it to play all your favorite traditional card games (with a twist), or use it as a music theory learning tool. BUY NOW! In Chops, the traditional card suits of Hearts, Diamonds, Clubs, and Spades have been replaced with Whole Notes, Half Note, Quarter Notes, and Eighth Notes. Counting black keys, there are thirteen notes from Middle C to High C, the same number of cards in each suit of a traditional deck. In Chops, the Ace of Hearts has been transformed into the Middle C of Whole Notes. The 8 of Spades is now the G of Eighth Notes. 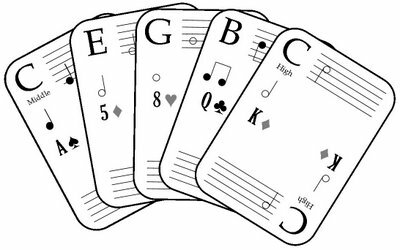 Each card in a traditional deck has a corresponding musical card in Chops. BUY NOW! Use Chops to play Solitaire by yourself, Crazy G’s with your son or daughter, or Five Chord Draw with a group of friends. With Chops there is no traditional card game you can’t play. But Chops can be used for much more. Learn music theory while having fun. Educators can use Chops as musical flash cards or as a tool for learning chords and structure. Have students construct chords with Chops as part of their lesson. Create Scales. Piece together musical intervals. Or utilize Chops in other creative ways to help students better understand various aspects of musical theory. Duke had ’em. Bird had ’em. Miles had ’em. You got Chops? BUY NOW!